The 1979 Monaco Grand Prix was a Formula One motor race held on 27 May 1979 at Monaco. It was the 37th Monaco Grand Prix and the seventh round of the 1979 Formula One season. The 76-lap race was won from pole position by Jody Scheckter, driving a Ferrari. Clay Regazzoni finished second in a Williams-Ford, with Carlos Reutemann third in a Lotus-Ford. Patrick Depailler set the fastest lap of the race in a Ligier-Ford. In a race of attrition, John Watson was fourth in his McLaren-Ford, Depailler fifth despite an engine failure on the last lap, and Jochen Mass sixth in his Arrows A1. Mass had run as high as third in the race and seemed to be closing in on the leaders before brake issues dropped him down the field. This was the last Formula One race for 1976 World Champion James Hunt. Hunt qualified tenth in his Wolf-Ford before retiring after four laps with a transmission problem. 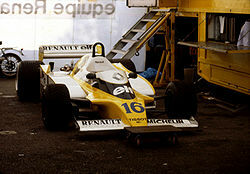 René Arnoux's Renault RS10 parked in the pits. The Wolf Racing pit crew. Carlos Reutemann finished third in a Lotus 79. Jody Scheckter 76 laps (1–76). ^ "1979 Monaco Grand Prix". ESPN. Archived from the original on 17 July 2015. Retrieved 6 December 2015. ^ "James Hunt - Obituary". Motor Sport. July 1993. p. 8. ^ "1979 Monaco Grand Prix". formula1.com. Archived from the original on 9 February 2014. Retrieved 23 December 2015. ^ a b "Monaco 1979 - Championship • STATS F1". www.statsf1.com. Retrieved 19 March 2019. Wikimedia Commons has media related to 1979 Monaco Grand Prix.